A. They were reaping in their wheat harvest in the valley. B. It had been seven months since the ark was taken. The people throughout Israel had returned to their normal activities. C. We never expect the unexpected. We never anticipate the extraordinary during the ordinary. We never look for the thing we should desire the most. …and they lifted up their eyes, and saw the ark, and rejoiced to see it. B. This is the only mention that we have of this Joshua in Scripture. One event in the history of Israel wrote his name on the pages of eternity. …and they cleaved the wood of the cart, and offered the kine a burnt offering unto the Lord. A. They used the cart and the two milch kine sent by the lords of the Philistines. C. The trespass offering was now turned into a thank-offering unto God. 1. “In the burnt-offerings they consecrated themselves afresh, with all their members, to the service of the Lord; and in the slain-offerings, which culminated in the sacrificial meals, they sealed anew their living fellowship with the Lord” (K&D, e-sword). 2. “The offering of these sacrifices at Bethshemesh was no offence against the commandment, to sacrifice to the Lord at the place of His sanctuary alone. The ark of the covenant was the throne of the gracious presence of God, before which the sacrifices were really offered at the tabernacle” (K&D, e-sword). B. They took down the coffer with the jewels given by the lords of the Philistines. A. They put the ark and the jewels on the great stone. B. We know nothing about this stone other than its name (See I Sam. 6:18, the great stone of Abel). 1. How it got into the field, we do not know. 2. What purpose it served, we do not know. 3. Exactly how large it was, we do not know. A. They returned to Ekron. B. These men left that scene with great relief. Now the hand of God was removed from them. What had brought them joy, the ark, when it came into their possession now brought them joy as they saw it leave from their possession. And these are the golden emerods which the Philistines returned for a trespass offering unto the Lord; for Ashdod one, for Gaza one, for Askelon one, for Gath one, for Ekron one. B. The priest and diviners had suggested just five mice. The lord of the Philistines, however, thought it good to send an image of all the towns that had been impacted by the invading mice, fenced cities and country villages included. C. This verse does not contradict I Samuel 6:4. It only presents additional information. Remember, we did not read of the mice in chapter 5. It was not until chapter six that they are revealed. The more we read, the more we learn about the destruction that came upon Philistia. B. We do not know which Abel this was, nor do we know why it was named after him. A. To some extent they help us date the book. B. The writer indicates that some time had passed between the event he is reporting and the time of the writing of the book itself. B. It is not surprising that some of the men might have been curious about the contents of the ark. Had the Philistines touched anything within? Had they removed the tables of stone? Was anything therein broken? Thus, they opened the ark. B. Most believe that this number reflects a corruption that entered into the text. 1. Beth-shemesh was a small town, approximately 7,000 people. 2. Over 50,000 people were not working in the field. 3. It is thought that the 50,000 is an addition. some explanatory word is omitted.” (e-sword). b. Most likely 70 men approached the ark with the intent of looking into the ark. …and the people lamented, because the Lord had smitten men of the people with a great slaughter. C. LESSON: If men would obey the Lord, they would have less suffering and less sorrow. D. LESSON: We have seen that God is a God of severe punishment. 1. Israel was twice defeated in battle. 2. The sons of Eli, Hophni and Phinehas, were killed. 3. 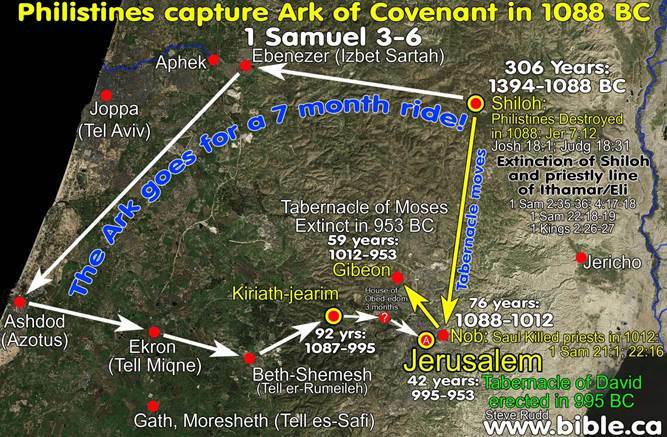 The ark of God was captured and taken into Philistine territory. 4. The cities of Ashdod, Gath and Ekron were tormented. 5. A plague of mice was sent throughout the land of Philistia. 6. God slew several men of Israel for looking into the ark of God. A. Who is able to stand before this holy Lord God? B. To whom shall he go up from us? A. Once the men of Beth-shemesh had been slain, the people recognized their error. They had violated one of the holy things of God. B. The punishment reminded them that no man can stand and defy this holy God of Israel. A. The second question shows that they were not planning on keeping the ark of God. They were already questioning where they wanted to send the ark. B. To whom (the next group of people) shall he (God as represented by the ark) go up from us. 9. T – F The children of Israel did as Samuel instructed them to do. (I Sam. 7:4). 16. What was the emotional reaction that Israel had when they heard about the Philistines? (I Sam. 7:8). 18. What did Samuel offer as a burnt offering unto the Lord? (I Sam. 7:9). 26. T – F After this battle, the Philistines came no more into the coast of Israel. (I Sam. 7:13). 28. What cities that had been under Philistine control were returned to Israel? (I Sam. 7:14). 29. “And there was _______________________ between Israel and the Amorites” (I Sam. 7:14). 30. T – F Samuel judged Israel all the days of his life. (I Sam. 7:15).